Now that that’s settled, let’s begin! The brief for the logo was simple, but sophisticated. The logo had to reflect an alternative rock band (hint of oriental). As with all our projects we try to involve the client throughout the whole process, and as much as possible their audience, friends, other designers, and random people. We use Basecamp to collaborate together. 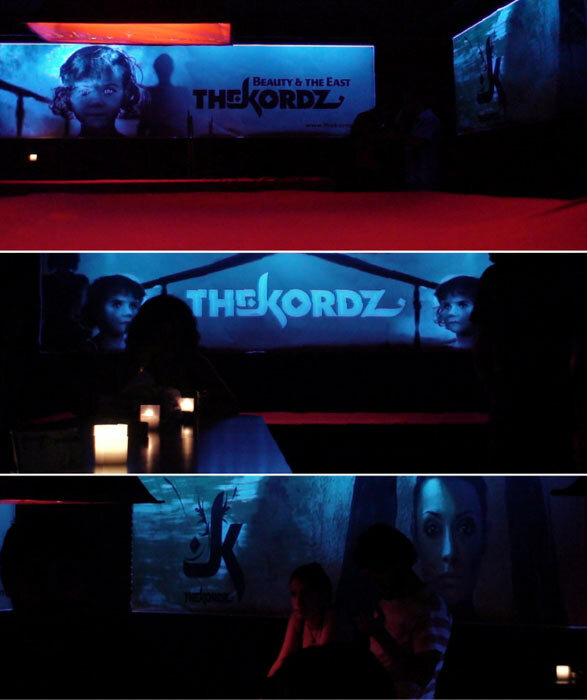 Below are the very first sketches while trying with the members of THE KORDZ to determine a direction for the logo. Everyone saw potential in the options on the lower-left, and the top logo on the upper-right. The khaki logo (3rd one, upper-right) came later-on and was done by our lovely friend Kristyan Sarkis. Then comes a loonng process were we ended up with a logo that got lots of positive feedback, you can spot the ‘z’ in arabic. 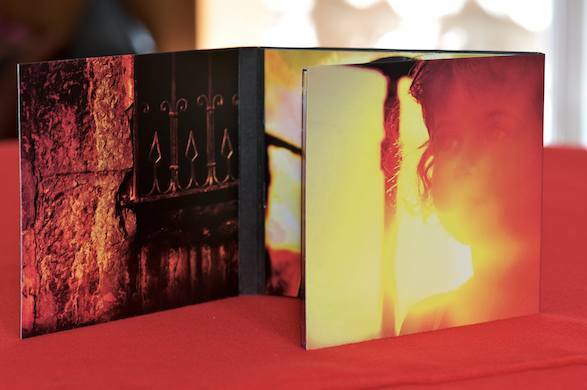 Unfortunately the general shape was very triangular, and could not be easily used in albums, stationary, T-shirts, mugs, drums, etc. It would best fit on the lower left of layouts, which was inflexible and cumbersome. Next we tried to solve the triangular issue, and gave the logo (symbol) lots of thought. …until we settled with an uppercase type (Futura) that actually stood it’s grounds, was simple, flexible, and easily applicable to different branding uses. The challenge was to find that cunning twist which would give it an oriental feel, without appearing forced. You can notice the ‘K’ in both arabic & latin, and the subtle ‘z’ in arabic at the end. Some final touches did the job, the ‘R’ & ‘D’ were modified slightly to make a more consistent interaction between the letters, and the ‘Z’ was completely reconstructed. Kristyan fine tuned the ‘point’ we used for the ‘E’, ‘O’ and ‘Z’, and voila! 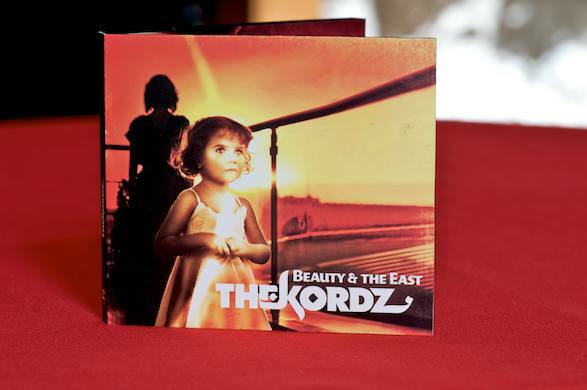 THE KORDZ loved it, and so did everyone collaborating on this project :). They loved the interaction and complete synergy between logo & logotype, the flexibility in their uses, and it’s striking presence. The logo can be used in either one of the 3 variations above (each one was crafted individually to compensate for the differences in perception between black/white backdrop & stroke weight). This same logo is suitable for print, offset, web, newspaper, fax, stamps, etc. Next are some logo/logotype applications. T-shirts were printed for the launching event at Nova. 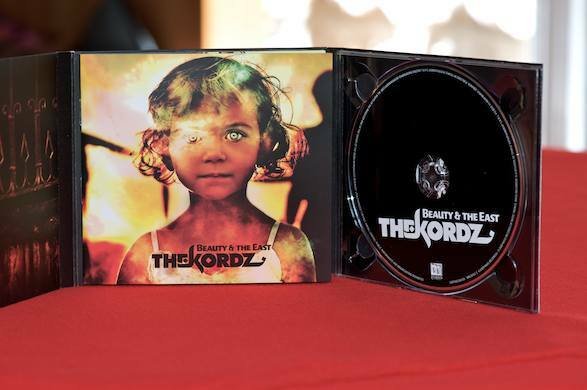 Some photos from the launching event for the new album ‘Beauty & the Beast’ and the application of THE KORDZ brand image in Nova. 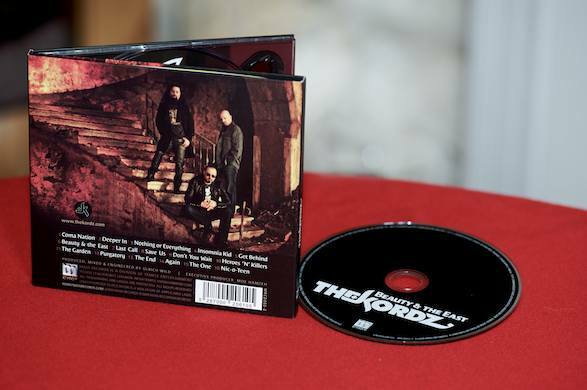 update: THE KORDZ are on their 1st Euro tour! 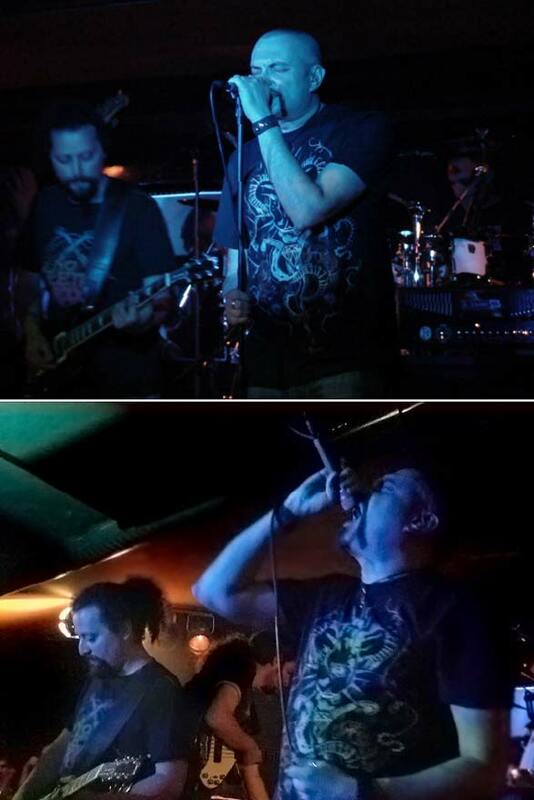 check them out on facebook! Tell us what you think by commenting below, what do you like and what you don’t, we’re always on a quest to move forward, and the lightest feedback helps. thanks so much moe. this means a lot to us. we enjoyed every second of it. loved the story, process, and outcome..
guys, you never stop impressing me! mike! missed you! 10x a lot, but do pass by, we’re always designing close-by 🙂 love. .-= sabine´s last blog ..Markaz Dari – Baalbek, Lebanon 2009 =-. 10X Sab! how was ur clowning workshop? people loved it, i’m sure! Beautiful process, beautiful identity, beautiful finishing. That’s one lucky band there! well done there for design! .-= Joanna´s last blog ..RNUAL 3 Presentation =-. Thanks Lara! as always, trying to raise the bar for design in Lebanon, and specifically the design process in Lebanon. Most designers think they are the absolute authority in design, which is not always true, the client knows his business better, and his clients know what they want better. So let’s involve them in the design process! it’s called collaborative design, watch this clip to learn more. kaly! great to see you pop-up here, missing u! Glad you liked it 🙂 pass by when u can, u know our design studio in jounieh, u’ve been here before. love.